Today is the birthday (1919) of María Eva Duarte de Perón, the second wife of Argentine President Juan Perón (1895–1974), First Lady of Argentina from 1946 until her death in 1952, and officially recognized as Spiritual Leader of the Nation. 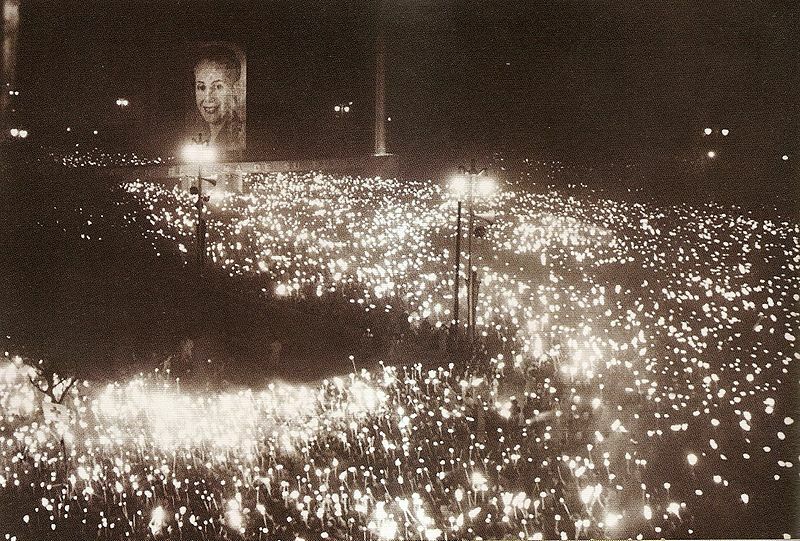 She is formally referred to as Eva Perón, but in Argentina she is always known by her diminutive, Evita. Argentinos rarely use diminutives; they are reserved for family and others who are exceptionally intimately close. No one here EVER uses my diminutive. Nicknames are used instead of diminutives by friends and associates to express familiarity. So the fact that people in Argentina call her Evita to this day indicates just how close they feel to her. She is embedded in the soul of every Argentino, like tango and the gaucho, and if you are not Argentino you will never grasp the feeling. You might get it intellectually, but not with your soul. In fact for outsiders to refer to her as Evita is slightly insulting. In her day Evita evoked deep passions. Some people saw her as a saint, others as a scheming, self serving egoist. Some saw her as the savior of the poor, others as someone who used her charities to enrich herself. She was loved by the people, and despised by the military. She has been characterized as a sincere, genuine, loving woman, and also as a superb actress whose public image was carefully crafted to fool the people. This is a blog post and not a book, so I cannot get into all I think about this. Instead, I will try to dissect for you, in brief, how I understand the period when she succumbed to cancer and died. As an anthropologist and Argentino I would like to help you with some context to better understand those days. First a little background. On 9 January 1950, Evita fainted in public and underwent surgery three days later. Although it was reported that she had undergone an appendectomy, she was diagnosed with advanced cervical cancer. Fainting continued through 1951, with extreme weakness and severe bleeding. By 1951, it had become evident that her health was rapidly deteriorating. Although her diagnosis was withheld from her by Juan, she knew she was not well. She underwent a secret radical hysterectomy in an attempt to eradicate her advanced cancer, but it had already metastasized. 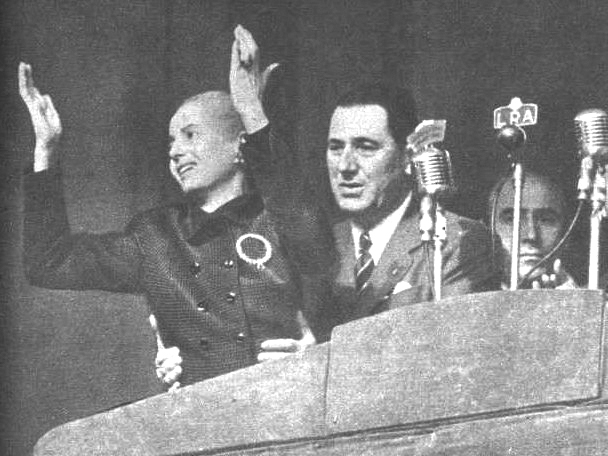 On 17 October 1951 Evita delivered her final public speech. Here are two video clips of segments of her speech to give you a sense of the woman. She was so weak by then that Juan had to support her much of the time. Evita was granted a state funeral and a full Roman Catholic requiem mass. Her body was embalmed immediately and lay in state in the presidential residence, La Casa Rosada. People waited in throngs to get a chance to glimpse her. Crowds flooded the streets for a 10 block radius, completely blocking traffic. In all 8 people died, and over 2,000 were treated at local hospitals for injuries sustained in the crush to see her body. On 9 August her body was transferred to the Congress Building for an additional day of public viewing. On Sunday 10 August, after a final Sunday mass, the coffin was laid atop a gun carriage pulled by CGT (Confederación General del Trabajo de la República Argentina) officials. 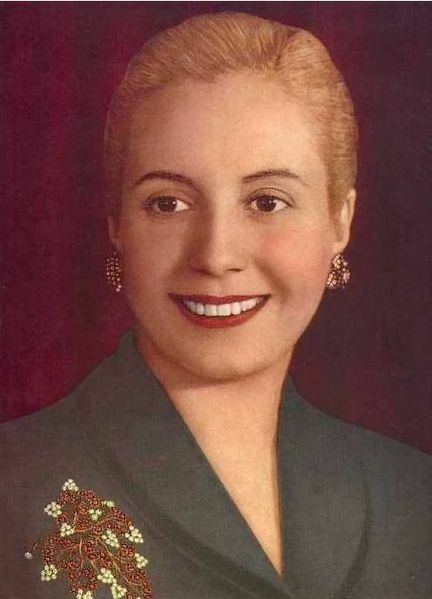 Following was Perón, his cabinet, Eva’s family and friends, the delegates and representatives of the Partido Peronista Femenino—then workers, nurses and students of the Eva Perón Foundation. Flowers were thrown from balconies and windows. Nearly 3 million people attended. There are two quite distinct interpretations of the spectacle of Evita’s dying in full public display, which I can roughly characterize as the outsider and the insider views. Outsiders (and Argentine cynics) see it as an opportunistic, politically staged drama to milk an ignorant public for sympathy, and to drum up support for a repressive dictatorship. Insiders see it as a genuine outpouring of Evita’s love of the people, and her need both to show herself to them and to hear their expressions of devotion. In tandem with this, Argentinos deeply appreciated their ability to voice their emotions directly to her, and not simply in public demonstrations in her absence. The insider view is almost completely alien to Westerners, even those in Spanish-speaking Catholic countries. Let me be clear. I am not talking about the funeral now. We’ve all witnessed massive state funerals with hundreds of thousands of weeping mourners. I’m talking about the fact that Evita chose to go through the act of dying in front of all the people. In the 1950’s, and even now, Argentina had two faces. There was the one the world saw – a sort of mini version of Europe located in South America. Buenos Aires has been called the “Paris of the South.” Buenos Aires is, without doubt, the most European of all Latin American cities. This is the Buenos Aires the tourists see. But there is another Argentina that visitors almost never see. This is the Argentina that was forged in the 19th century through wars of independence and bloody civil conflict, through efforts of nation building, and through the long process of creating an economy founded on herding and agriculture. The ethos developed in this era is sometimes called hispano-creole, where creole is a translation of “criollo,” meaning a person of Spanish heritage born in Argentina. This ethos is almost impossible to explain. It has its roots, in part, in Europe, but it is NOT European. It is unique to Argentina. Tango and the gaucho are products of this ethos, and so was Evita. Dying in public is one expression of this ethos. Catholicism as a whole has a fixation with death, but people in Catholic countries, like Protestants, have a habit of hiding the process of dying away in secret. Hence, Evita’s actions are seemingly incomprehensible and have to be explained away as political drama. But that’s not it. The old hispano-creole tradition sees the time of dying as a time to revel in the splendor of life, made poignant by the fact that death is so near. Evita was celebrating the fact that she had lived a full life that was packed with meaning. I won’t deny that her actions served the peronistas well. But that was not Evita’s primary motivation. Her’s was a desire to be affirmed by the people that the way she had lived her life was the right way, and that she had succeeded in her endeavors. We all could use that in our dying days. One food typifies the soul of Argentina more than any other – dulce de leche. It is basically sweetened milk that has een boiled and boiled until it is reduced to a thick, creamy, caramelized wonder. It is the taste of my childhood. Various kinds of caramelized milk product are produced worldwide, but dulce de leche is pure Argentina. For most of the late 19th and 20th centuries it was known only to Argentina and neighboring countries. But more recently it has been marketed to countries worldwide largely due to the spread of Argentine immigrants who cannot live without dulce de leche. You can make it yourself, either the long way, that is, by boiling sweetened milk for days (not recommended), or by punching a few small holes in a can of sweetened condensed milk and placing it in boiling water for several hours until you see the milk sputtering from the holes turning dark brown. It’s simpler to buy it if you can, however. In the supermarkets where I shop in Buenos Aires, whole aisles are devoted to the various brands of dulce de leche. You should be able to find it too if you live in a good-sized city; or you can order it online. 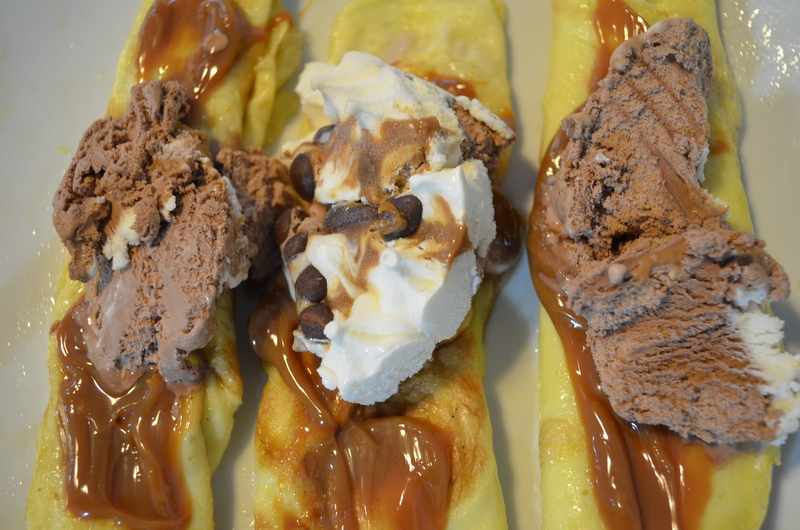 Heat butter in a crêpe pan and add a small amount of batter to the pan with a ladle – enough to form a thin layer. Tilt the pan in all directions to make sure the pancake is thin and evenly distributed. When the pancake is spotted golden on the bottom, flip it and do the same for the other side. Turn it out on to a plate, spread with dulce de leche and roll it up. Top with more dulce de leche and whatever else suits your fancy – whipped cream, ice cream, whatever. Repeat.